Choose color and size when ordering. Prices vary by color and size. Top x Bottom x Height/ Slant. From top to bottom of the lampshades front face. This shade comes white, eggshell and beige in the following sizes. 9 x 10 x 10. 10 x 11 x 10. 11 x 13 x 11. 13 x 14 x 14. 14 x 15 x 15. 15 x 16 x 16. 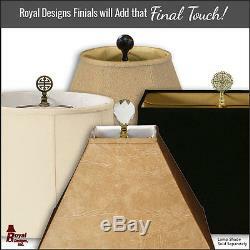 This Basic Drum Lampshade is a part of Royal Designs, Inc. And is perfect for anyone who is looking for a traditional yet stunning lampshade. 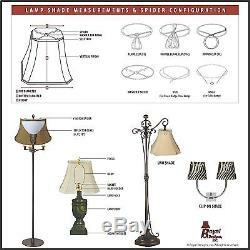 Royal Designs has been in the lampshade business since 1993 with their multiple shade lines that exemplify handcrafted quality and value. (except Linen, Mouton & Burlap fabrics). Off-White softback lining (Black & Burlap fabrics have gold lining). 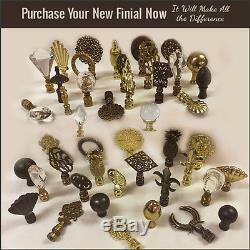 Standard brass-finish spider fitter , use a finial to fasten shade. All shades with 9+ top diameter have a V-Notch fitter for use on a 6 or 8 reflector bowl. Top and bottom trim (single or double) with vertical piping. Heavy grade rust resistant metal frame. Suggested maximum wattage is 150-watt for most sizes (clip on shade max 60W). Please measure your existing shade--a replacement harp may be needed for a proper fit or additional adjustment if changing height of shade. 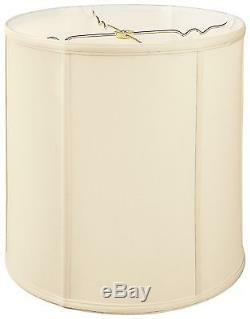 The item "Drum Lamp Shade (BS-719)" is in sale since Monday, January 06, 2014.